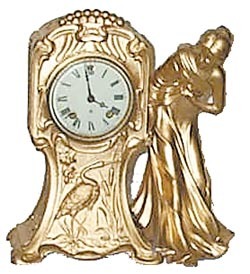 Ansonia Clock Co. novelty statue clock, "Girl and Swan". 8 day, half hour strike. Round, signed movement, standing gong, runs. French sash, beveled glass. Correct back door and pendulum. 13 inch metal case with a recent gold treatment, not too bad.